If you live in eastern North America there is probably a life-and-death struggle going on near you between the local spiders and a particular wasp. 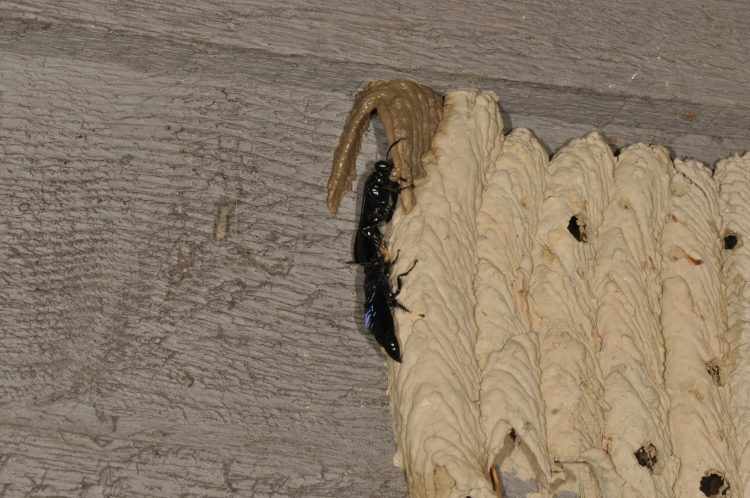 The wasp is famous for its remarkable mud nests, the beautiful Pipe Organ Mud-dauber Wasp (Trypoxylon politum). 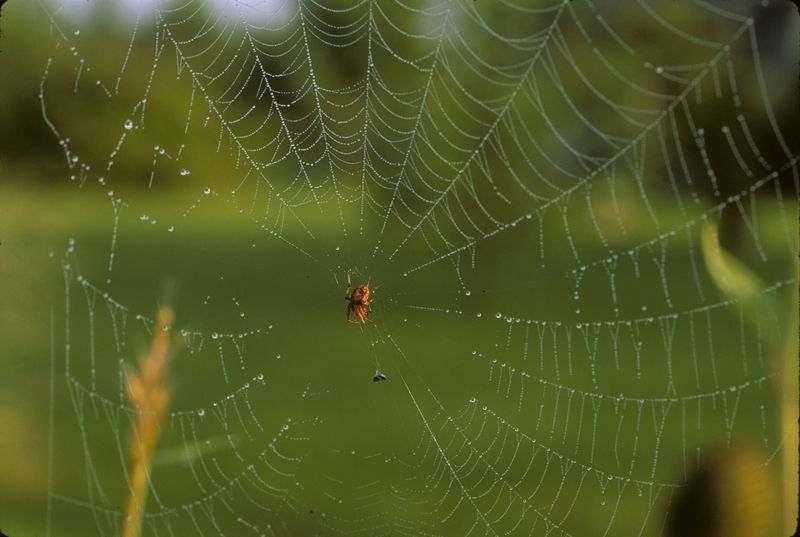 This is one of the most frequently encountered predators of spiders in our region. 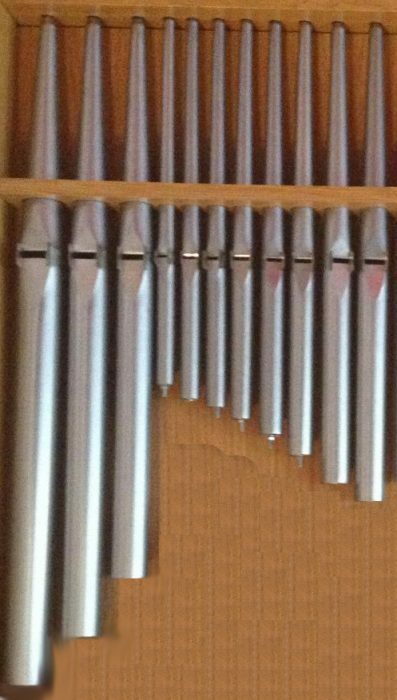 It builds conspicuous mud nests with a tubular shape that some people think resemble organ pipes (because of their varying length and parallel arrangement). 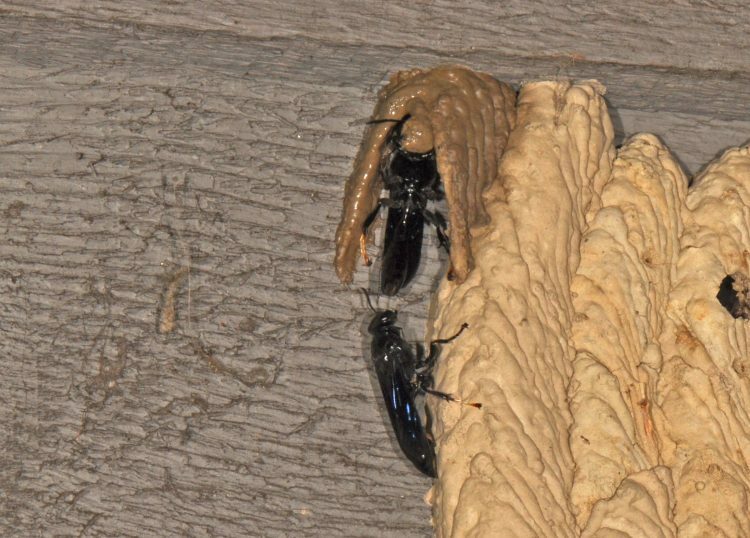 This wasp builds its pipe organ mud tubes to house her family. The carefully constructed tubes are built of wet mud that she collects from the neighborhood. 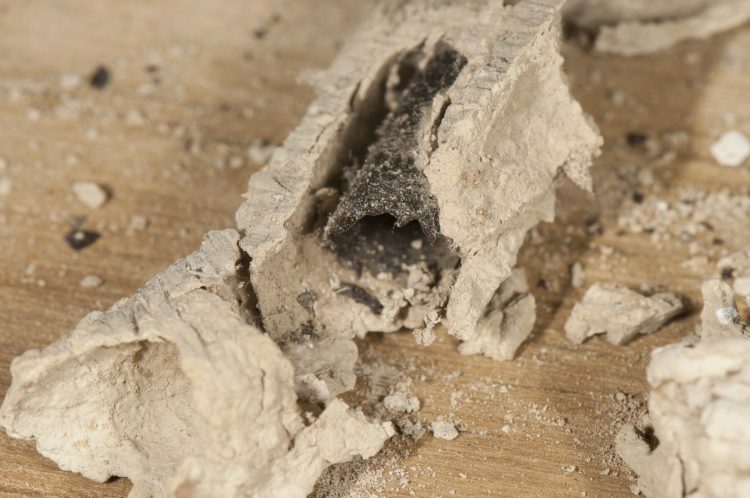 Each load of mud is added to the tube creating a series of ridges, looking almost like the coils of hand made coil-built pottery. 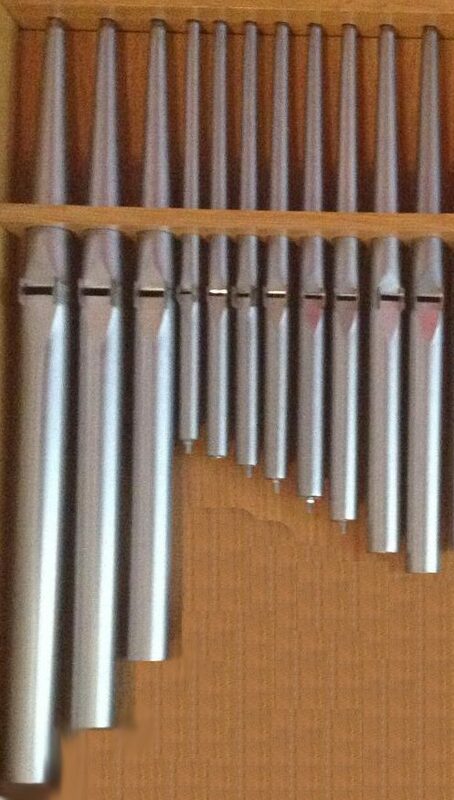 When dry, the tubes become quite hard and durable. Here is another series of photos of a female arriving with a mud ball and spreading the mud along the edge of the tube forming a new extension. When a tube is ready, she will fly out and capture a spider. After she captures a spider, she paralyzes it with a sting, then stuffs it into the tube. The spiders aren’t dead, just immobilized. They are alive and will remain so until they are eaten by the baby wasp (larva). 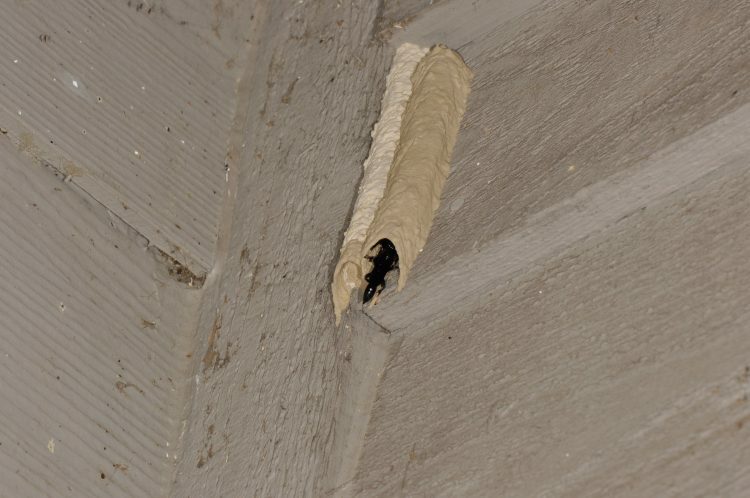 As she provisions her nest tubes, there is often a second wasp seen hanging around near the entrance. 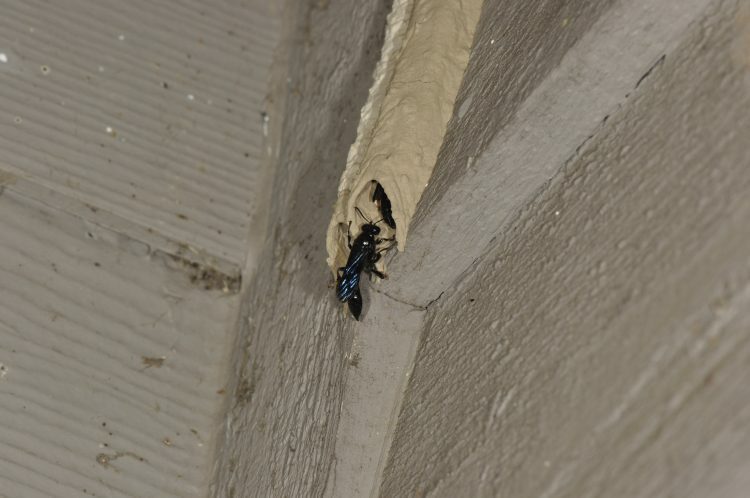 This is a male Trypoxylon, guarding the female and her nest. I assume he is likely protecting his mate from other males who might try to mate with her. When the mother wasp has provided enough zombie spiders as food she will lay an egg on one of the spiders then seal up that section of the tube. 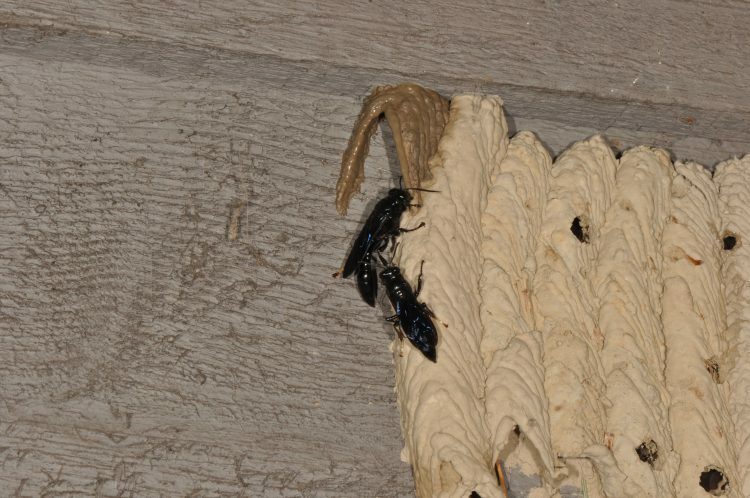 The pair of wasps actually mate inside the tube and the male holds the female as she lays the egg. 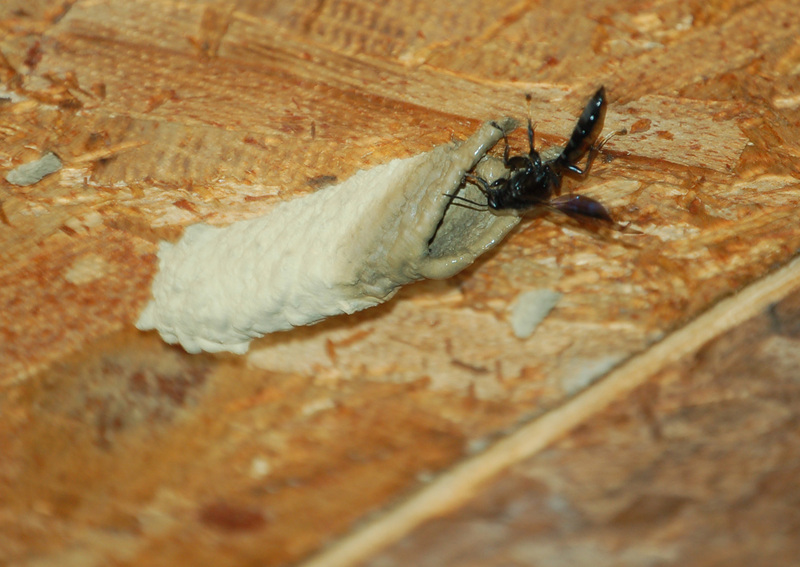 The female now seals the zombie spider prey and her egg by making a mud partition. 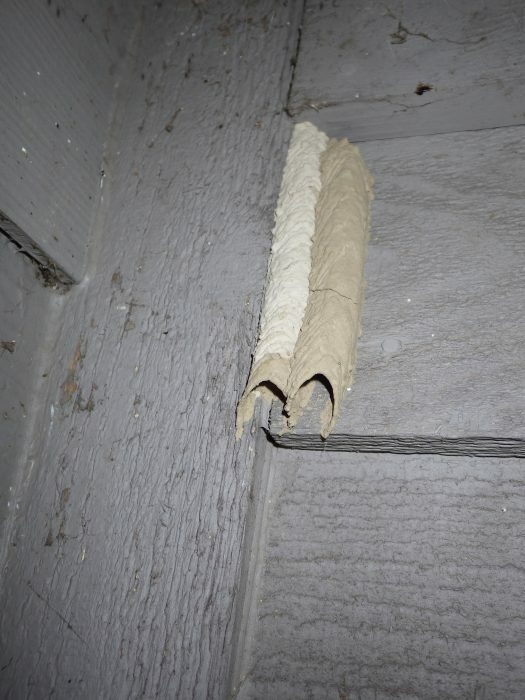 Eventually each tube will have several compartments, each with a supply of paralyzed spiders and wasp eggs. The egg will hatch into a larva and begin to devour the paralyzed spider. As it eats, it grows and molts. 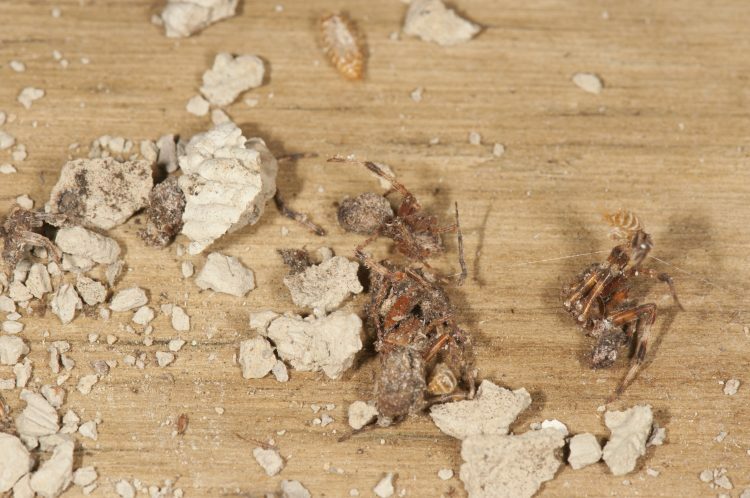 The larva looks a bit like a maggot at this stage, munching through one “fresh” paralyzed spider after another and growing. After eating the entire cache of zombies, the larva will construct a survival capsule called a cocoon and molt into the pupa. 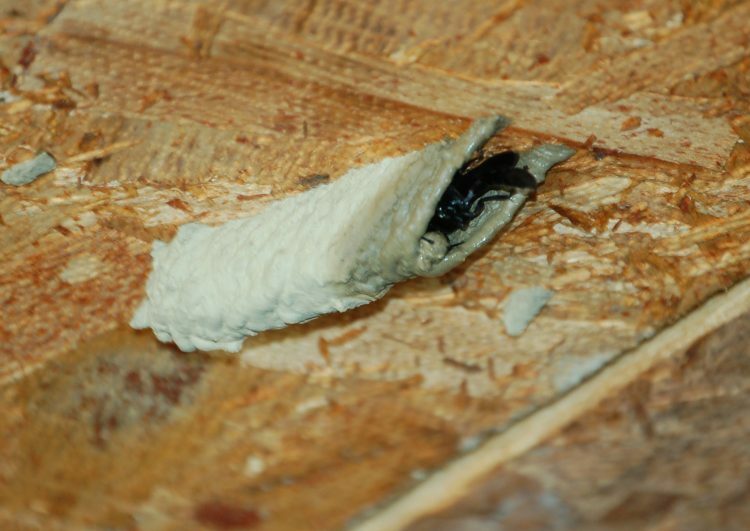 At this stage the little wasp looks like a tightly folded pale mummy sealed in a brownish sarcophagus. In her article about the variable life history of Trypoxylon politum, Jane Brockmann has published a nice description of the life cycle of these wasps*. The egg hatches in a couple of days, consumes the prey spiders in about five days, then spins a cocoon (which hardens into a dark brown capsule-shaped pupal case in a few days). 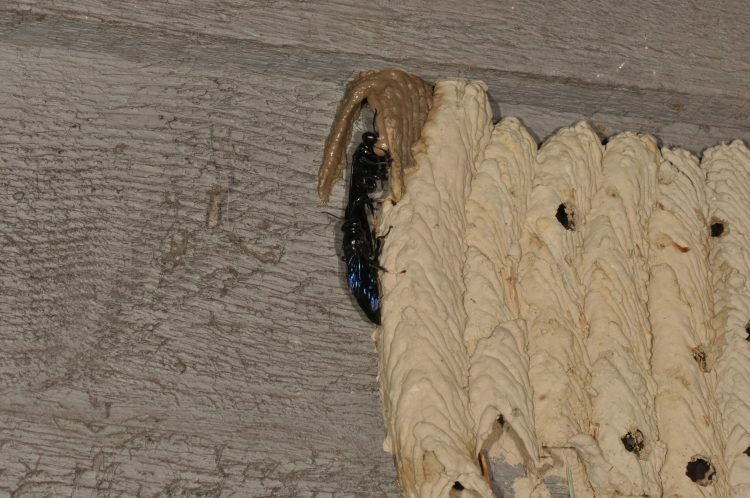 When metamorphosis into a wasp is complete, the young wasp emerges from its pupa and digs its way out of the mud chamber. 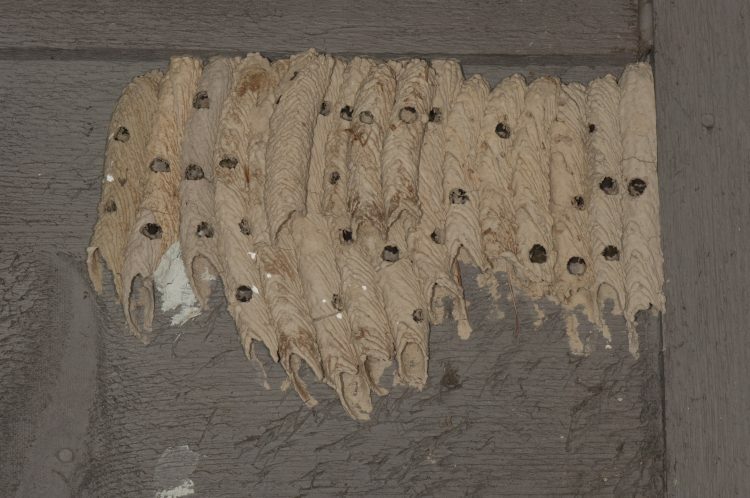 According to Brockmann, some of the young wasps emerge about six weeks after pupation, in the same summer. Others enter a “resting stage” called diapause. These individuals will spend the winter in the tube and emerge the following spring. 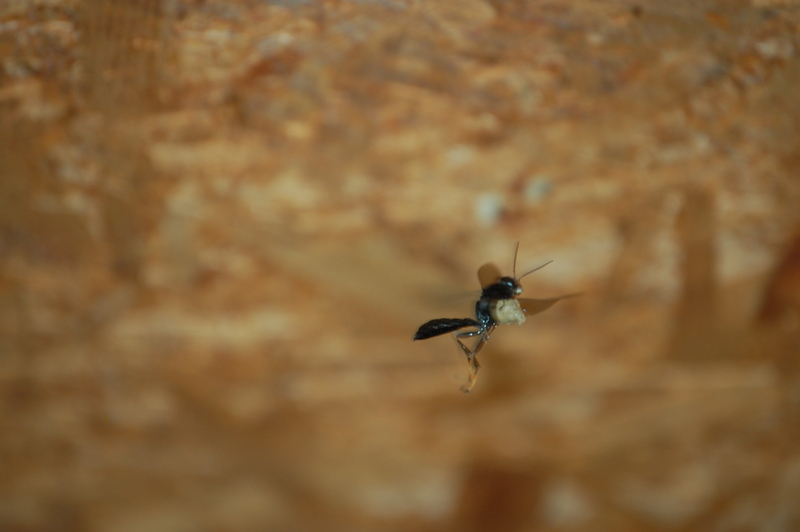 This wasp, aka Trypoxylon is skilled at capturing spiders out of their webs. Her favorite prey are small orb-weaving spiders. In the mud nests that I’ve dissected from around my house, the spider victim most often taken is Neoscona arabesca (aka arabesque orbweaver). Sometimes the wasps also take immature Araneus marmoreus (aka marbled orbweaver) that are about 1/2 grown (roughly the same size as adult N. arabesca). Perhaps the size is the critical feature that the wasp is using to make her choice. 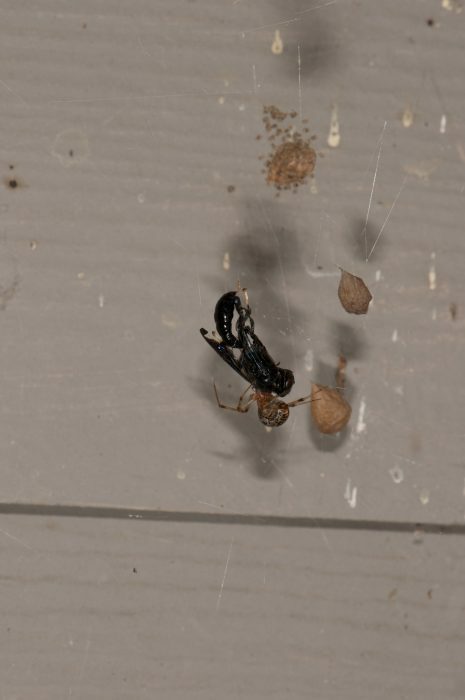 So it is clear that this wasp is a real threat to the local spiders. Imagine my surprise when I noticed one of the wasps (the male) hanging as a prey item in the web of one of the Common House Spiders (Parasteatoda tepidariorum) on the side of our house. 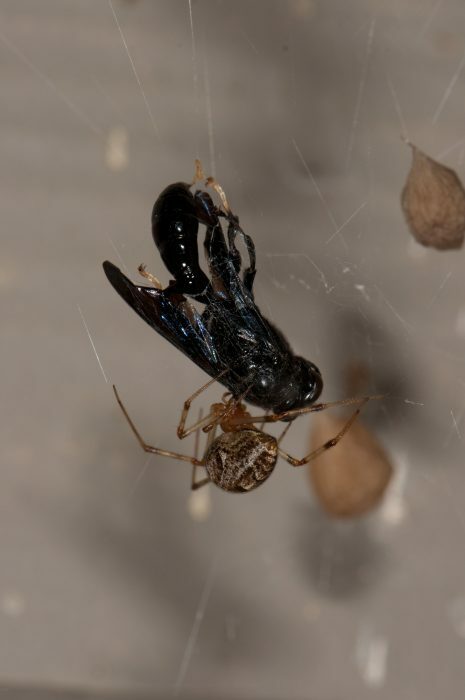 Somehow it seems like poetic justice to have a spider capture and kill a wasp that specializes in eating other spiders. It isn’t clear to me that Trypoxylon is capable of capturing Parasteatoda. The typical prey of Trypoxylon are orb weavers with their flat circular webs. Thus the orbweaving spiders are exposed to direct attack. In contrast, the web of Parasteatoda is a complex tangle of nearly invisible threads filling a three-dimensional space. The spider hangs within this tangle. For the wasp, it would be very difficult to approach the spider without getting tangled in the web, and potentially being captured. Maybe this is how this spider predator became spider food. Here is a closeup shot. Remarkable names are the rule in “scientific” terminology. Sometimes they are used enough by enthusiasts that they become the “common name” for the species. This is the case for both of these interesting animals. The Pipe Organ Mud-dauber Wasp (Trypoxylon politum) is often referred to as just “Trypoxylon,” and the Common House Spider (Parasteatoda tepidariorum) is often referred to as Parasteatoda. Brockmann, H. Jane. 2004. 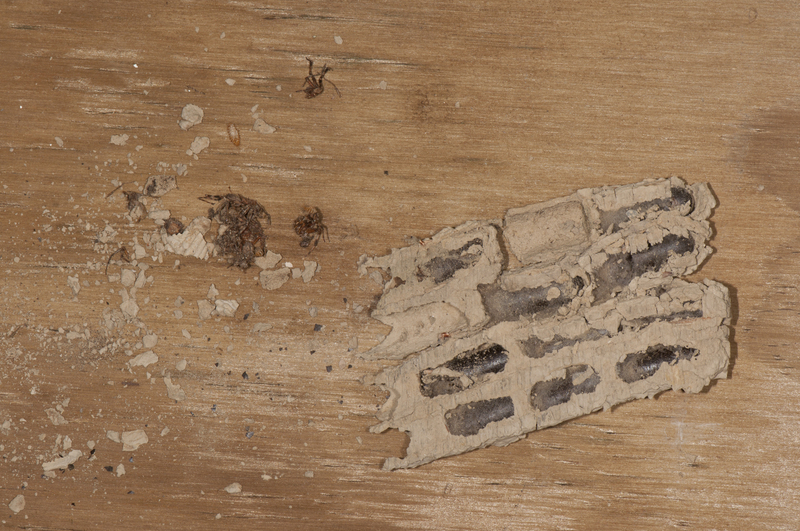 Variable life-history and emergence patterns of the pipe-organ mud-daubing wasp, Trypoxylon politum (Hymenoptera: Sphecidae). J. of the Kansas Entomological Soc., 77(4): 503-527.